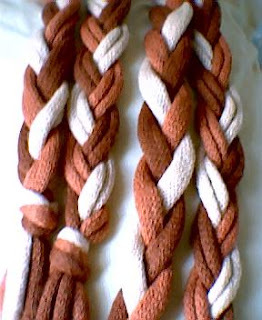 I finished the braided scarf yesterday. It looks really cool draped around my neck. I'm very pleased with the results. 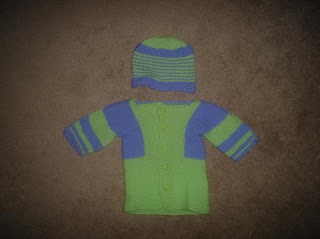 Next up is the sweater set I made for my nephew's first Christmas. It's too big for him to wear right now, but it should make a nice outdoor jacket for the spring. I was in a rush to get my sister's socks in the mail in time, so I don't have pictures to post. They were just plain blue socks--nothing lacy or fancy. I plan to do a lot more knitting on my 2 days off this coming week, so I'm sure it won't be long before I have new pictures to post. Hope y'all have a great holiday!